to behave like Adolf Hitler. To imitate Adolf Hitler. 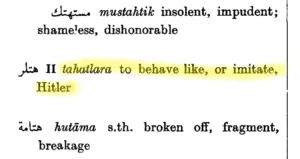 In the present tense, it is: يَتَهَتْلَرُ‏‎ (“yatahatlaru”). To be honest, I never came across this weird verb in daily talks. I also have never encountered it in newspapers or books. 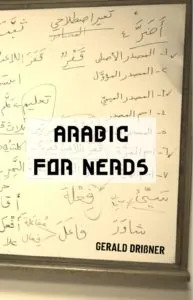 I quickly checked with my Arabic-Arabic dictionaries and couldn’t find it. So don’t ask me why the editors of Hans Wehr’s dictionary have included it. I don’t even want to imagine what “to behave like Hitler” should express. Nevertheless, there is something interesting about it – the morphology of the verb. The verb تَهُتْلَرَ is the second form of a quadriliteral root derived from the name Hitler, in Arabic: هِتْلِر. Quadriliteral roots – which by the way means consisting of 4 root letters – are occasionally used for foreign names or things. 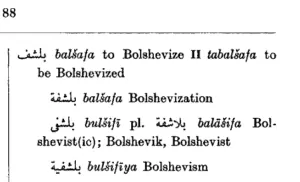 For example another weird verb found in Hans Wehr: “balshafa” (بَلْشَف) – to Bolshevize – which also forms the II-form “tabalshafa” (تَبَلْشَفَ) – to be Bolshevized. This verb is certainly not common in English nowadays. For all readers who are not sure what it means – Colin’s dictionary explains the verb as follows: to bring into line with Communist ideology. Now let’s look deeper into quadriliteral verbs. FORM I (فَعْلَلَ) quadriliteral verbs follow the conjugation of form II triliteral verbs (فَعَّلَ). 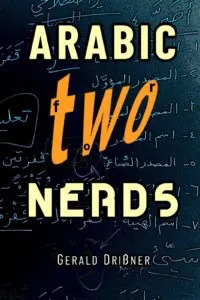 The only difference: You have two different radicals in the quadriliteral verb at the position where you would have two identical radicals (with شَدّة) in a triliteral verb. The مَصْدَر of a quadriliteral root follows the pattern فَعْلَلَةٌ; occasionally also فِعْلالٌ is used. Thus a translation is called تَرْجَمة in Arabic. The active participle (اِسْم فاعِل) follows the pattern مُفَعْلِلٌ, thus a translator is a مُتَرْجِم. What does form I express? the verb بَسْمَلَ conveys: to say “in the name of Allah” (بِسْمِ اللهِ). From this root, the مَصْدَر is an important word for Muslims: the Basmala (بَسْمَلة). And there are many words of foreign origin which were Arabized by deriving a quadriliteral root. So far, so good. But why do we use form II (تَفَعْلَلَ) of a quadriliteral root to express that one behaves like Adolf Hitler? Form II of quadriliteral verbs have a reflexive meaning, sometimes also a passive meaning. That is the reason why for “actions” like this, the II-form of a quadriliteral root is used. So much for the grammar. Some remarks on Adolf Hitler in the Arab world. Mein Kampf was published by Adolf Hitler in 1925/1926. Around ten years later, when Hitler started to drag the world into an apocalyptic misery, the entire Arab world was in a different shape than today: France and Great Britain shared it out. The same happened in Iraq. According to an account of Prof. Shmuel Moreh (سامي موريه), an Iraqi Jew, walls were painted with ٍSwastikas and sayings such as: “Hitler, the protector of the Arabs!” (هِتْلِر حامِي الْعَرَب). With national movements emerging in the Arab world, Hitler was praised for being an enemy to France and Great Britain. In the 1930s, parts of Mein Kampf were translated into Arabic by journalists who published some excerpts in Arabic newspapers. 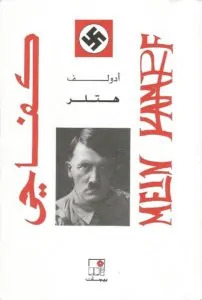 The German Nazis wanted to translate Mein Kampf officially into Arabic. This was, however, a difficult task. The Nazi ideology was based on the supremacy of the white Aryan race (جِنْس آري). The Nazis disparaged Egyptians, for example, as “decadent people composed of cripples”. Furthermore, they had to change several expressions which would have otherwise targeted the Arabs as well, for example: anti-Semitic to anti-Jewish. Despite several attempts before and during World War II, an official translation of Mein Kampf by the Nazis was never published. Louis al-Hajj (لويس الْحاج), a translator and writer from Lebanon, who later became the editor in chief of the newspaper al-Nahar (النَّهار) in Beirut, translated parts of Mein Kampf from French into Arabic in 1963. Al-Hajj’s translation contains only fragments of Hitler’s 800 pages pamphlet. Nevertheless, Louis al-Hajj’s translation is still the most popular edition of Mein Kampf in the Arab world. My favorite example of a westernized quadriliteral root is فرنج p. 832. Form II of this root means exactly “to become Europanized”. As Wehr indicates, it originates from the time where being French meant being European. But today, being European means being Western. Thus, today this westernized quadriliteral root means to become westernized. I looked up this root recently, because I heard it in the contemporary TV-series سارع جار which now runs on CBC (early 2018). Authors of dictionaries and encyclopedias often deliberately insert fake articles/headwords into their work. It is meant as a kind of copyright protection. Usually it is hard to tell if a dictionary has taken its repertoire from an older dictionary. If these fake entries are also copied, it becomes evident that it’s a case of copyright violation. So it’s an old strategy for copy protection. I’m not sure how it ended up in Hans, but I don’t think this is an actual Arabic word. I searched for it in the Oxford Arabic Corpus (which has almost a billion words of Standard Arabic, mostly news sources but also AWU texts and Wikipedia), and this word does not appear even once. If it was once in usage (which I somewhat doubt), it no longer is.